One of Asia’s 50 Best Restaurants comes to the capital for a three-night event dedicated to the finest locally-sourced shellfish prepared by celebrity Chef Dharshan Munidasa. For the first time in the UAE, celebrity Chef Dharshan Munidasa visits Abu Dhabi for a three-day Ministry of Crab pop-up event hosted at Shangri-La Hotel, Qaryat Al Beri, Abu Dhabi from 25th to 27th April 2019. The event features four signature dishes from the famed Sri Lankan restaurant, which has been named as one of the top 50 in Asia. Chef Dharshan is best known for his focus on high-quality, fresh ingredients that he often pairs with Japanese cooking philosophies. Having gained a reputation for his out-of-the-box thinking and his knack for pushing boundaries, the renowned chef-restaurateur revolutionised Sri Lanka’s gastronomic landscape by putting it on the global culinary map. “I am very excited to introduce the delicacies we serve at Ministry of Crab to the UAE with this pop-up at Shangri-La Hotel, Qaryat Al Beri, Abu Dhabi. We receive many travellers from the UAE at the restaurant in Colombo and we are delighted to plate up our unique preparations to them in their home country,” Chef Dharshan said about bringing his pop-up menu to the UAE. The menu kicks off with a sharing plate of a creamy Crab Liver Pâté, followed by the rich Baked Crab, likened by many to a Crab Risotto. A winning dish is Garlic Chilli Prawn that Chef Dharshan cooks in Italian olive oil, Japanese soy sauce, garlic and chilli flakes in a style that is unique to Ministry of Crab. Ideal for two to share, the much-loved Pepper Crab celebrates two ingredients endemic to Sri Lanka, where the freshness of the crab is fused with the heat of hand-crushed peppercorns, whole peppercorns and pepper stock. “We’re delighted to be hosting the Ministry of Crab pop-up with Chef Dharshan. His delicious signature dishes bring a taste of the distinguished Sri Lankan cuisine to our shores, with Chef Dharshan himself at the helm of the kitchen, the event is set to be a success. Knowing his penchant for fresh ingredients, we’re sure it’s going to be a visual treat and a culinary delight” said Ahmed Issa, General Manager of Shangri-La Hotel, Qaryat Al Beri, Abu Dhabi. 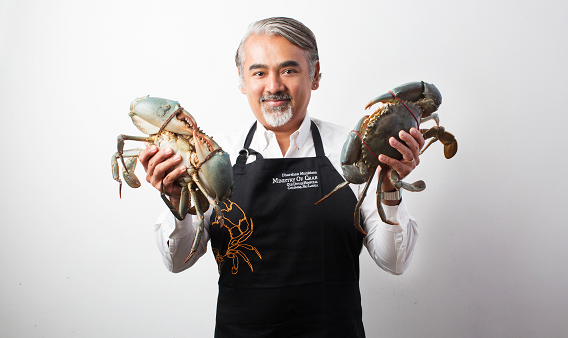 Ministry of Crab, Sri Lanka’s first restaurant dedicated to serving export-quality lagoon crabs, is the brainchild of celebrated chef and restaurateur Dharshan Munidasa, who partnered with Sri Lankan cricketing legends Mahela Jayawardane and Kumar Sangakkara in 2011 to bring the concept to life. The restaurant employs a daring no-freezer policy, sourcing all its produce locally with daily deliveries, as the co-owners believe that freezing both detracts from the taste and renders redundant the use of fresh produce. Chef Dharshan was born in Japan, and takes inspiration from the native culture to create his signature cooking style. He has been invited to create plenty of degustation menus at top dining destinations around the world, including Shangri-La hotels at The Shard in London, Hong Kong and in Singapore.